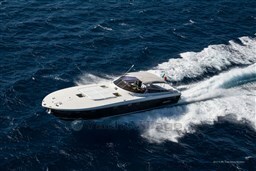 The new HD 120 is the most sporty and dynamic boat of Novamarine range. Born from the same hull of the multi-certificated Novamarine Professional 120, it maintains all the features of maneuverability and stability and safety. Aggressive lines, essential interiors, yet always customizable, and generous sunpads make it a unique model of its kind: impressive in the shape but austere in contents. Propelled by three outboard engines up to 400 hp, the 120 HD dominates the water and flies up to 52 knots giving thrill and amusement in full safety. 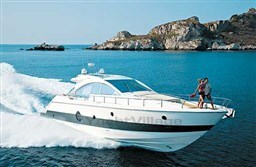 The new HD 120 is the most sporty and dynamic boat of Novamarine range. Born from the same hull of the multi-certificated Novamarine Professional 120, it maintains all the features of maneuverability and stability and safety. 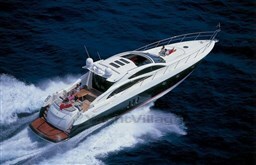 Large fwd sunpad and convertible lounge aft, opening side doors, stereo system, separate head in the console area. One captain on board, berth in Poltu Quatu. 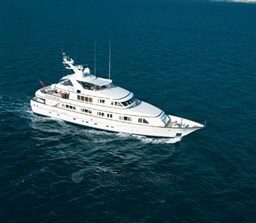 It is possible to have her longer in the day for € 2.000 plus fuel. 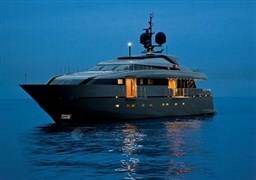 12 guests allowed on board. 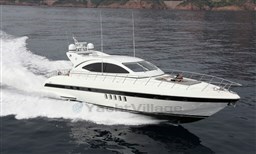 Dear Sirs, I have seen on YachtVillage your offer about Novamarine Hd 120 - 2016 (code: 408145). I am interested in the offer and would like you to contact me. Thank you.